Onward to infinity... the melodies and rock-star poses never stop, and neither do the emotions. One trend in the 15-year-career of Canadian pop/rock group Sloan (stars in their own country, cult heroes elsewhere) has been towards excess. From around the time of their third album, 1996's One Chord to Another, and even more evidently on their fourth album, 1998's Navy Blues (a double-album in the vinyl version), they began treating each album like it was an epic rock n' roll classic. Gatefold covers, iconographic photos of the four band members in rock poses -- arms up, ready to strike guitars/drums/bass with abandon -- and songs referencing the vagabond, always-on-the-road lifestyle of the rock star. Their first live album (1999's 4 Nights at the Palais Royale) was, of course, double-live…or, come to think of it, quadruple live, in the vinyl version. These days, their music isn't quite as in-your-face with the rock star milieu as it was back in the late '90s -- they've managed to smooth their sound out into one steady sort of melody-over-crunch style of rock. Yet still they act the parts of stars, out of sincere love for music more than wish fulfillment. And they play their style of melodic power-pop as if they're the kings of rock n' roll; that's power-pop less by a strict genre definition than by the way they play their pop songs like they're AC/DC or Led Zeppelin, or at the very least the Stones. Excess is the name of the game in a certain way. So even though their sound isn't as excessive these days, it should be no surprise that they're still approaching their albums in a big, big way. After three comparatively small albums between 1999 and 2003 ("small" meaning compact and un-dramatic, but not out of step musically with the rest of their albums, and not without the same rock-star demeanor), they're back in 2006 with 30 songs on a single disc. And not just 30 songs, but 30 songs that range from short (52 seconds) to long (five-and-a-half minutes), and add up to 80 minutes of music. 30 songs that slam into each other, with little or no break between, the way you'd expect songs on a much shorter album (one of those 25-minutes-and-we're-out affairs) to behave. 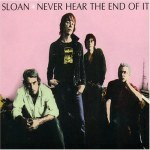 These songs are generally of the same ilk as those on the last few, more-humble-in-appearance Sloan albums -- a spare pop sound led by melodies rather than dramatic hooks and choruses, a progressive variation on the foundation laid by their first work in this direction, 1994's Twice Removed. Combine that fact with the solid-rock, 30-songs-real-fast set-up of the album and Never Hear the End of It begins to resemble not a carefully structured epic rock album so much as a river of Sloan music, an unending, constantly moving stream of typically Sloan-esque songs. The overall de-emphasis on big hooky choruses amplifies this effect, since a persistent melodic atmosphere is what's on center stage. It becomes easy to get lost in this river of songs, to not know where you're standing. It's not that each song taken on its own wouldn't sound unique, but taken together they blend together into one body of music. There are touchpoints along the way, musical monuments that stand taller than the others. Usually, these are the songs that vary stylistically from the rest, or those with the biggest/best hooks. The tracks in the former vein are either the power-crunchiest ("Something's Wrong", the angry punk-like "HFXNSHC") or those that find some new slant on the standard Sloan style, like the pure piano ballad "Live the Life You're Dreaming Of", or the intriguing surreal-story-song set to a folk-pop-rock structure in "Set in Motion". The songs with the furthest reaching hooks, musically speaking, also tend to be the songs with the strongest emotional hooks, too, where a feeling seems raw enough, dire enough, or bold enough to stand out within a sea of songs that often deal with emotions -- with emotional mistakes mostly, and the act of moving beyond them. The group's twin themes as of late, as here, are music itself (the act of making it, the power of it) and how we act in life towards other people. Many of their most memorable songs resemble confessions or observations about how people act, positively or negatively (often negatively) towards the people they love. "I Understand", the album's longest song, launches with glazed-over harmonies and a great tune a hopeful quest for love based on understanding. But most of the songs possess a less confident approach to feelings. On "Everybody Wants You", bassist Chris Murphy sings in an ambiguous but at the same time confessional way about a feeling he has that's "so wrong / I hope nobody hears about it". The splendid hook of "Can’t You Figure It Out" exemplifies a sensitive sort of confusion. And "Right or Wrong" has one of the album's most memorable choruses, one that could sum up the theme behind a whole slew of Sloan songs: "Right or wrong, we're breaking their hearts again". Pay attention to the lyrics, and Never Hear the End of It seems like not just a river of music, but a river of human emotion as well, with all human flaws, dilemmas, and idiosyncrasies running on to infinity, as the album seems to. At one point, they proclaim that it's the "Last Time in Love", but of course there will be more times, as there always is. The same goes for pop/rock gems, there's always more; Sloan is part of a historical river of creativity, not an end-all, be-all. Think of it that way, and an album that might on the surface seem like an ego trip actually comes across as quite humble, perhaps their most humble album since their first two. The title Never Hear the End of It is no doubt a joke about how many people will listen to all 80 minutes, or a joke at the flack they expected to receive by jumping so deeply into their music, but it also works to sum up the deep reservoir that exists within this single disc -- a reservoir of tunes, of rock style and pop melodies, and of emotions. It's a never-ending whirlpool of an album, a conceptual statement about music, time, and the human experience that at the same time isn't a statement at all: just another batch of songs, containing many that rank among their best.